Men weren’t the only ones to fight the war against Napoleon. Today’s story is about the extraordinary destiny of the famous “cavalry girl”, the Russian Amazon Nadezhda Durova. Nadezhda came from the family of a cavalry captain serving in a hussar regiment. Her mother had been dreaming of a son and wasn’t particularly happy when a girl was born. She never cared too much about her daughter’s upbringing. Nadezhda grew up amid hussars. Since early childhood she got used to marches, drills and camps. “My first cradle was a saddle; my first toys and amusements were horses, weapons and a military band”, she recalled later. The hussar way of life struck deep roots in her mind. As a girl, she often played war games, liked swimming, arrow shooting, tree climbing and horse riding. Nadezhda’s mother was abhorred by her manners. When Nadezhda turned eighteen, her mother decided to marry her off. There were several candidates whom she believed to be a fairly good match for her daughter. But the obstinate girl rejected them all. Soon, however, Nadezhda yielded to her mother’s pressure and married a calm and reasonable public service officer. But she was unhappy with him, even the birth of their son didn’t improve the situation. She couldn’t bring herself to love her husband. One night Nadezhda cut her hair short, put on an army uniform, which changed her beyond recognition, and left secretly. Without anyone realizing she was female, Durova enlisted a cavalry regiment as a rank-and-file uhlan under the name of Alexander Sokolov. The regiment was preparing for a military campaign abroad. By that time nearly half of Europe had been under Napoleon’s control. The threat of French invasion was looming large on the horizon. Russia moved a 100-thousand-strong army against the newly emerged would-be master of the world. The cavalry regiment Nadezhda Durova had joined took part in the coalition war of 1806-1807. She got her baptism of fire near Guttstadt in Germany. Their squadron charged several times. Durova was awarded a silver St.George’s cross for saving a wounded officer at Guttstadt. During the campaign she showed indomitable courage. In an impressive display of stamina and fortitude she endured all hardships of military life: on horseback day and night in any weather; death; bloodshed; musty dried crusts and water from a puddle; no chance of warming oneself or changing into a dry uniform. For fear of being unmasked, Durova preferred keeping to herself. When officers were carousing around the fire, she had to keep aloof from company, denying herself the warmth she so desperately needed. She found it much harder at rest than in battle. Sooner or later, however, the truth got out. Rumor of a brave cavalry girl fighting against Napoleon reached Emperor Alexander I, who ordered to bring Nadezhda Durova to St.Petersburg in male guise. Alexander gave her a warm reception and awarded her a St.George’s cross for the battle of Guttstadt. That could be the end of the story but for Durova’s resolve to remain in the army. She begged the Emperor to permit her do so. Amazed, Alexander voiced his approval. 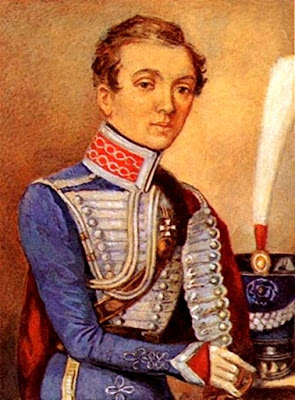 Durova enlisted in the Mariupol cavalry regiment as Cornet Alexandrov. Then came the year of 1812 and the battle of Borodino… “A hell of a day!” she wrote later in her memoirs. “The wild roar of both artilleries nearly made me deaf. There was no fear in my soul and my face didn’t change color for a single moment. I was calm, yet I wished we stopped fighting”. She was shell-shocked and her left leg got swollen, but she refused to go to a hospital. Instead, she went straight to Field-Marshal Kutuzov and volunteered to serve as his orderly. “What’s your name and how old are you”, Kutuzov asked. “Cornet Alexandrov”, she said. Kutuzov stood up, hugged the cornet and said that he had heard a lot about him and was glad to meet him. Thus Nadezhda Durova became Kutozov’s orderly. Regrettably, the wound sustained at Borodino forced her to leave the army… Two decades later Nadezhda Durova wrote her famous memoirs.